If you like Harley Quinn and would like to have her near then these Harley Quinn knee socks is what you want. 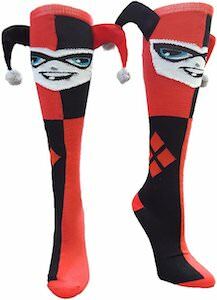 The socks are red and black and even have diamonds on it and to make them even more special they added the face of Harley Quinn on the front and the sides of the jester hat are sticking out of the socks. Just imagine wearing these cool socks with a fun skirt, shorts, or dress and you will be admired by all the Batman villain fans. The Harley Quinn socks are moister wicking and breathable and fit shoe sizes 5 – 10.